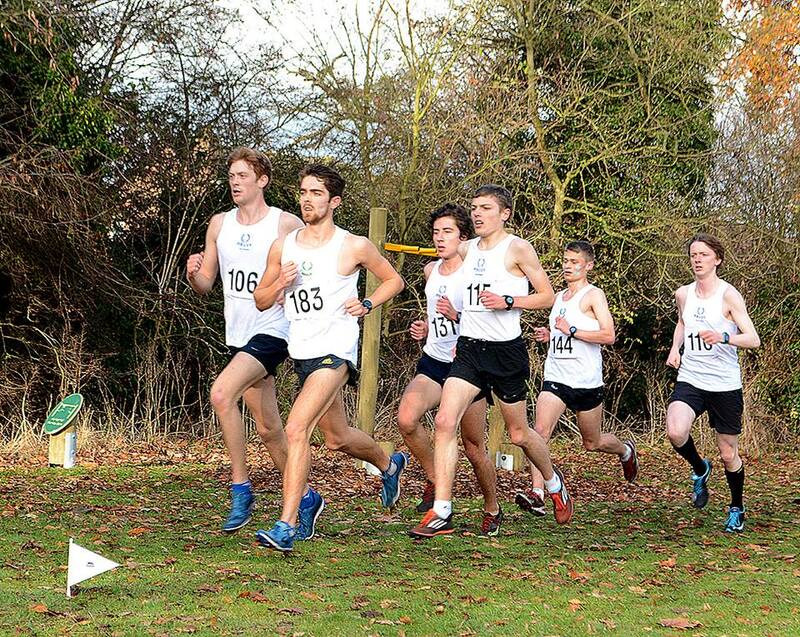 The annual Oxford vs. Cambridge IInds to IVths cross-country races. In other words, V-day round one. Often referred to as a ‘warm up’ or ‘understudy’ for the Blues Match, the event does an excellent job of proving this label incorrect. And rightly so, after all, the fundamentals are no different: dark blue vs light blue, two teams, one prize. Run. Other than a distinct lack of blazers, carnations and old men in Thames Hare & Hounds beanie hats reminiscing their university days, it has all the same anticipation, drama and confusing white vests as Wimbledon Common. Priory Park, St. Neots, served as a first time venue this year, following council rejection of the permit application for Wandlebury Park. When asked to comment on the reasoning behind this, Mr Ellis explained that whilst he fully supports running conventions across the country, he could not make an exception for incompetent Oxbridge students for the third time in two years. Thus at half past ten on Saturday 26th November 2016 we found ourselves stood in a foggy field on the outskirts of Cambridge, watching a kids football match and wondering, as we often do, where on earth the Tabs had got to. First thoughts were to pass the time by walking the course, however this turned out to be somewhat impractical on realisation that the course was yet to be marked out. Instead we had to make do with zip wiring across the children’s play park until our rivals decided to show up. It wouldn’t be a race report without mentioning the OUCCC tent, and it is pleasing to be able to report that it stood with considerably more grandeur than it had done two weeks earlier, probably because Aidan had crutches in his hands so couldn’t help. Eventually our competitors emerged from the blurry horizon and greeted us with race numbers and course markings. Kick starting the action was the 30th Ladies’ Seconds race. With final team huddles and motivational speeches complete the girls lined up and waited for their cue to open the show. The light blues looked to be dominating for much of the first lap, but Rachel Skokowski and Emma De Camp held their own in the leading pack. Emma chased hard over the second half of the race and took a brilliant third place individually, only five seconds adrift of second. Tilly Woods came through for an impressive fifth place, demonstrating the huge progress she has made this term and staking her claim as one to watch for the future. Following Tilly home was Annika Halverson in sixth, and having fought hard to prevent Cambridge dominance at the start of the race, Rachel finished strongly in ninth. She was backed up by Rebecca Pullon, Kennagh Marsh and Anna Sharp. Cambridge took a deserved overall victory but the dark blue girls definitely put up a fight. With five newcomers all gaining valuable Varsity experience things are looking bright for the team’s progression over the next few years. Next to toe the line were the athletes for the 69th Gentlemen’s Seconds. In contrast to the preceding race it was Oxford who looked to be controlling this one from the gun. Miles Chandler, Alex Gruen and Jed Marshall all positioned themselves nicely at the front, with back up in the form of Nikki Faulkner, Oliver Paulin and James Sewry just behind. As the three lap race unfolded it was Club Captain Miles who pushed on and before long he was alone at the head of the race. In fine style he extended this lead around the final lap and brought home a thoroughly deserved Varsity victory. Behind Miles the other Oxford boys were following his example and tearing the Cambridge team apart. The dark blues flooded into the finishing funnel as Alex and Jed battled hard to take third and fourth places respectively, with a stellar run from Niki bringing him across the line in sixth just ahead of Olly in seventh and James in eighth. Not to be outdone by their team mates further up the field Connor Haugen and Tom Fabes were right up amongst the action, finishing tenth and twelfth respectively and thus both beating multiple Cambridge scorers. Unsurprisingly this utterly dominant show meant an Oxford Victory for Miles and his merry men. Quote of the day goes to Capt. Chandler who, in the frenzied aftermath of tab-smashing let out a bewildered exclamation of, “I don’t think I’ve ever won a race before!”. Varsity is certainly not a bad place to break that trend, although one would imagine that some thorough secondary school results analysis is probably in order before that fact can be officially verified. No doubt namesake Mr. Weatherseed will be able to use his Power of 10, well, power, to help us out on this one. The Men’s II race gets underway. Starting just five minutes after the seconds, the 62nd Gentlemen’s Thirds followed swiftly in their footsteps, but the race could not have panned out more differently. As the sixteen blue and white vests rounded the U-turn on lap one, you could be forgiven for thinking you were not watching a cross country race at all but in fact a Championship track final. This was no surprise given the number of middle distance specialists who had taken to the start line, and it made for highly entertaining spectating throughout. Would King Louis become King Snail for the second time in his illustrious Varsity cross-country career? Or would his equally tactical, sprint finish-favouring rivals catch him out? The short answers to both of those questions were yes, and thus no. Bailings showed up, for once, and got the job done. Unfortunately for our boys, the Tabs fielded an incredibly strong thirds team and claimed second to sixth place behind Louis. James Collins was next home for the dark blues in seventh, closely followed by Colum O’Leary. Glen Wright Colopy, Noah Hurton, Rowan Capper, Aaron Smith and Joel Spratt completed an Oxford team who did not give in under the light blue pressure and all put in great performances, but were ultimately beaten by a stronger Cambridge contingent. Rounding off the day were the Mob (mob mob mob mob…) matches. First up, the ladies. With face paint, nail varnish and French plaits firmly in place (all the most crucial aspects of race prep, right Aidan? ), the girls were ready to do business. Emily Hoogkamer did exactly that as she took the race in her beautiful stride, won it by the most convincing margin of the day, and ran herself into a Blues reserve place. Natalie Beadle and Georgie Bingham ensured we were well represented at the front end of the race, taking third and fourth places respectively. 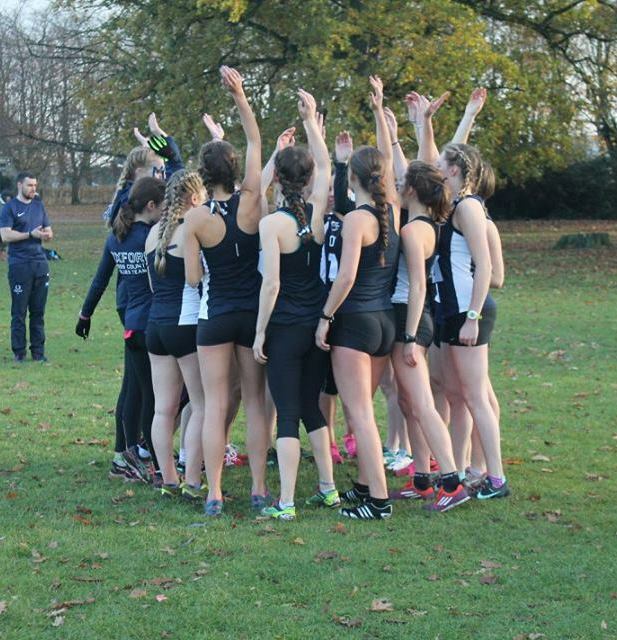 Despite narrowly losing out overall, the girls did Oxford proud and it was fantastic to see every single one of them, old and new members alike, getting stuck in and embracing the Varsity way of life – giving it your all no matter what. The same sentiment can be applied to the men’s equivalent, where Harrison McCartney, Rahil Sachak-Patwa and Aitor Alvarez all took top ten finishes, but Cambridge claimed their fourth team victory of the day through considerably superior strength in numbers. Overall a disappointing four-one loss for OUCCC, but as we departed tab-land and headed either home or onwards to dinner, drinking and dancing, the atmosphere was not one of a disheartened club. And nor should it have been. The camaraderie within teams, the unrelenting encouragement and positivity from spectators (despite some even risking their vocal chords), the belief and support from Kyle and the dedication displayed by every single athlete were what mattered. Upon arrival, our captains’ standout message had been simple – leave everything on the course. Anyone who turned to look back over the fields as we boarded the coaches for our departure would have seen that we had fulfilled these instructions to the max. We left behind not the desolate, spiritless playing fields that had greeted us, but a park forever imprinted with passion, emotion, bravery and team spirit. A park forever imprinted with Varsity. Is it even Varsity if you don't get a good profile picture out of it?